This upgraded version of the High Hatch cabinet incubator now offers an accurate digital thermostat with LCD display of Temperature and Humidity. An on-board computer monitors systems and the environment every second to keep itself updated and to share this data with you. Electronic egg turning control, audio/visual indicators and a standard easy view door highlight a number of new features. The High Hatch is a complete incubator and hatcher. 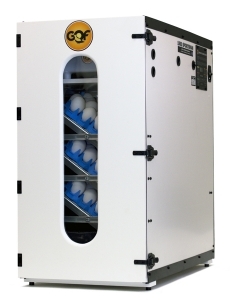 In addition to having three automatically turned trays (frames to hold plastic racks: size chosen below at extra cost), it has a hatching tray in the bottom of the incubator. Set the eggs each week or so and then hatch the oldest setting eggs at the same time. Settings are rotated among the three turning trays so that the hatching tray can accept the eggs from one of the setting trays each cycle. Another option is to set all of the trays at one time and at the end of incubation, level all of the setting trays to use all of the trays as hatchers. 110 Volt AC 225 Watts. ======= Total capacity when plastic egg trays are purchased from the list here. is: 744 Quail (the racks single stack). Molded posts on each rack permits double stacking for a total of 1368 quail eggs. 354 Pheasant (not stackable), 270 Bantam, Chukar, or medium Chicken, etc. (not stackable), 180 Turkey, Duck, Jumbo Chicken, etc. (not stackable). To set Goose eggs you will need to either buy the Setting Egg Racks sold here. Capacity for goose eggs depends on the size of the egg. Dimensions: 30 1/4” front to back, 15 3/4” Wide, 31 3/4” High. Special features found now in this incubator are: A new Digital Command Center; Monitors the health of the entire system every second. Any problems found are spelled out on the LCD display. Easy to use touch controls. Visual and Audible Alarms. Full digitally controlled heating system. Adjustments to the heater are made 20 times every single second. Included with all new cabinet model incubators. Cannot be purchased separately. All major electrical items - Digital Control Module, Heater, Fan, Sensor Module are all 'plug and play'. Digital Temperature and Humidity readouts are factory calibrated with high precision. One year warranty. Weight 96 lbs. Durable plastic trays shown in image are sold separately. Canadian customers please refer to Canadian distributors for this product.